Worked on Friday cutting a new trail on Hardy Rd. Saturday was also a work day for members of theWilmington Mt. Peddlers and BETA. We were able to compete the new section of trail. It offers a fairly easy ride thru pines and hardwood forests. It adds about approximately 1/2 mile to an existing loop. 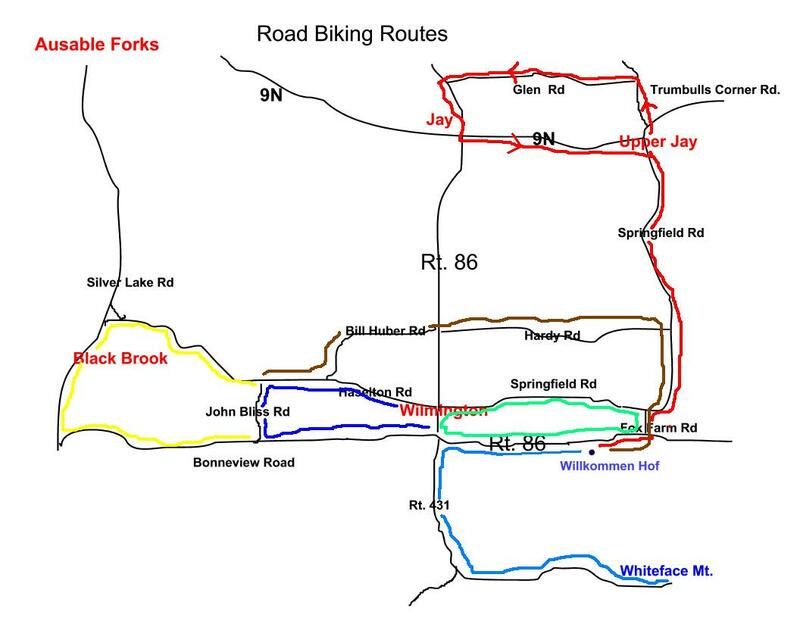 W 73 degrees 48' 2.5"
W 73 degrees 48' 50.8"
Just finished an 18.5 mile ride starting from the Willkommen Hof and going out to the village of Black Brook and back via Haselton and Springfield Roads. On the map, it would be the green, blue and yellow loops combined. This is a moderate loop with a few nice hills to climb and to ride down. It is really nice because a substantial part of the loop has just been paved. You can get a little more info or down load a PDF version of the map from our web site under the Road Biking link. Had a friend come up from downstate. We road the easy loop and the slalom through the pines and then went on to do the hard loop out, back, and up. This loop has a fair amount of climbing and expert riding. The rock work on this trail is amazing. I will post pictures of what the Wilmington Mountain Peddlers and BETA members have done. I took a GPS and camera for pictures and location details. I finally figured out how to post pictures. There are 2 overlooks on this trail that over amazing views of the valley and Whiteface. There is a fair amount of rideable terrain for the intermediate rider. Just got back from riding the trails at Hardy Road. Really some nice beginner, intermediate, and expert trails already in place with more to come. There is one loop of approximately 1.2 miles that is very nice. It gains a little bit of height and then runs down thru the pines. There is also a trail out and back that goes to a very nice lookout. I will take some picture on the next trip and see if I can figure out how to get them into this blog. If you're not familiar with Hardy Rd; it's very easy to find. Turn onto Fox Farm Rd. by the Hungry Trout Fly Shop. Take a right at the stop sign on Springfield Rd. Go about a mile and turn left onto Hardy Rd. Go for about another mile until you come to a clearing on your right with a small stone monument. You can park here. The trails begin just across the road. The trail to the left (south) is the easiest. It's splits to the right about .25 miles in and then goes up a gentle hill and then heads north and east down thru the pines back to your starting point It's a good start for beginners. Besides the mt. biking opportunities, there are also many back roads through out are area that offer leisurely country rides or something more serious such as the Lake Placid Iron Man loop that passes by our front door. 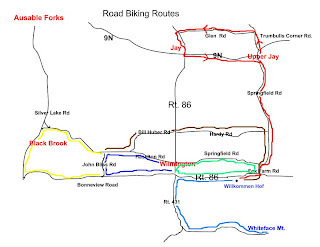 You can look at maps of our local loops at www.willkommenhof.com/biking.htm and www.downhillmike.com. My wife and I have been involved in mountain biking for the last 15 years. We are founding members of the Wilmington Mountain Peddlers. We have been working with other local residents and the DEC to build the Flume Trail Network.